Help students learn how to create customer value and engagement In a fast-changing, increasingly digital and social marketplace, it's more vital than ever for marketers to develop meaningful connections with their customers. 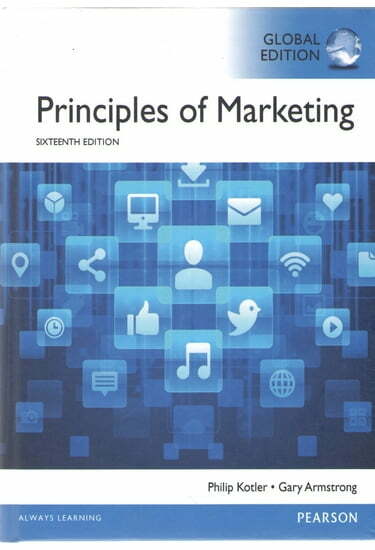 Principles of Marketing helps students master today's key marketing challenge: to create vibrant, interactive communities of consumers who make products and brands an integral part of their daily lives. To help students understand how to create value and build customer relationships, Kotler and Armstrong present fundamental marketing information within an innovative customer-value framework. Thoroughly revised to reflect the major trends impacting contemporary marketing, this edition is packed with stories illustrating how companies use new digital technologies to maximize customer engagement and shape brand conversations, experiences, and communities. MyMarketingLab not included. Students, if MyMarketingLab is a recommended/mandatory component of the course, please ask your instructor for the correct ISBN and course ID. MyMarketingLab should only be purchased when required by an instructor. Instructors, contact your Pearson representative for more information. MyMarketingLab is an online homework, tutorial, and assessment product designed to personalize learning and improve results. With a wide range of interactive, engaging, and assignable activities, students are encouraged to actively learn and retain tough course concepts. Also available with MyMarketingLab This title is also available with MyMarketingLab-an online homework, tutorial, and assessment program designed to work with this text to engage students and improve results. Hands-on activities and exercises enable students to better understand and master course concepts, and the skills required to be successful marketers today. Please note that the product you are purchasing does not include MyMarketingLab. MyMarketingLab Join over 11 million students benefiting from Pearson MyLabs. This title can be supported by MyMarketingLab, an online homework and tutorial system designed to test and build your understanding. Would you like to use the power of MyMarketingLab to accelerate your learning? You need both an access card and a course ID to access MyMarketingLab. These are the steps you need to take: 1.